Alexander Lobrano grew up in Connecticut, and lived in Boston, New York and London before moving to Paris, his home today, in 1986. 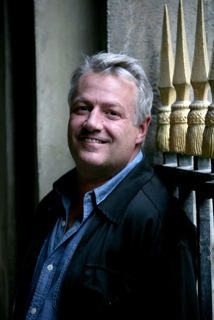 He was European Correspondent for Gourmet magazine from 1999 until its closing, and has written about food and travel for Saveur, Bon Appetit, Food & Wine, the New York Times, Wall Street Journal, Guardian, Travel & Leisure, Departures, Conde Nast Traveler, and many other publication in the United States and the United Kingdom. He is contributing editor at Saveur magazine, and his upcoming book Hungry for France will be published by Rizzoli in April 2014. 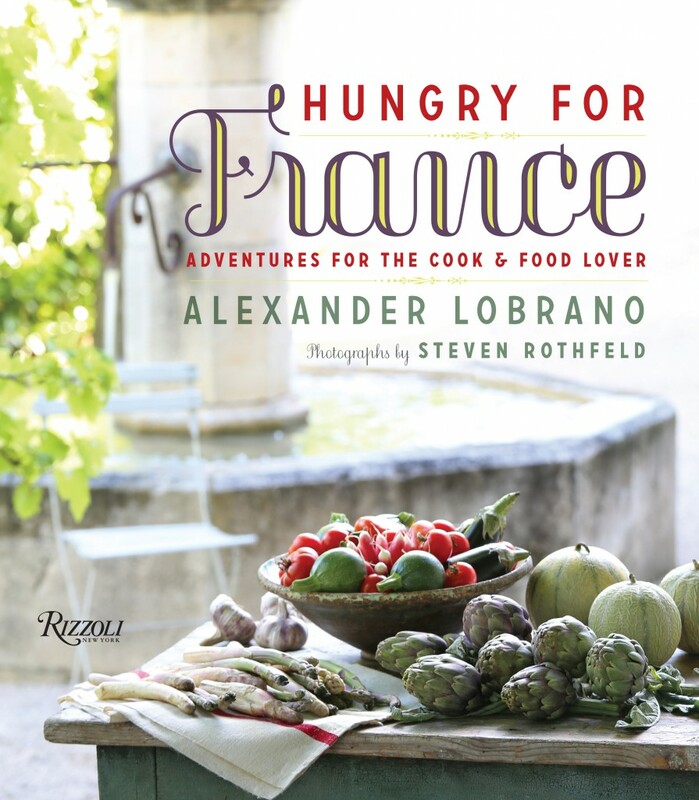 Hungry for France: Adventures for the Cook & Food Lover by Alexander Lobrano (author), Steven Rothfeld (photographer), and Jane Sigal (contributor), will release April 1, 2014 (Rizzoli). It is a culinary tour of some of the most alluring inns, food producers, restaurants and winemakers of France, with more than seventy-five recipes updating classic regional dishes. Each chapter covers a different region, from Normandy to Provence, and includes recommendations for a handful of the area’s most excellent, off-the-beaten-path restaurants, along with recipes. The more than seventy-five recipes sprinkled throughout exemplify contemporary riffs on quintessential regional specialties. Steven Rothfeld is a celebrated travel photographer whose work has illustrated numerous books by many authors, including Marcel Marceau and Frances Mayes. Visit: Alexander Lobrano’s “Hungry for France” —My Appetite for France (excerpt), (Rizzoli New York) excerpt published by permission in A Womans Paris, including recipe for Layered Ratatouille Gratin. 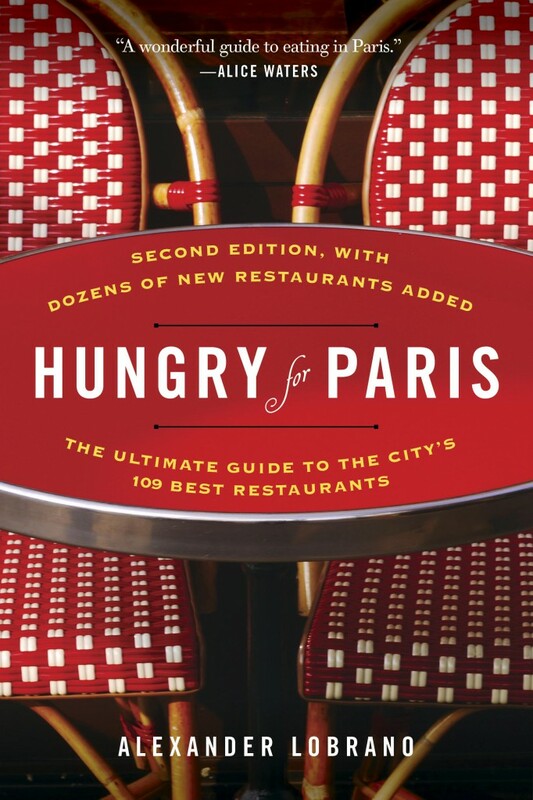 Hungry for Paris (second edition): The Ultimate Guide to the City’s 109 Best Restaurants by Alexander Lobrano, will release April 15, 2014 (Random House Trade Paperbacks). If you’re passionate about eating well, you couldn’t ask for a better travel companion than Alexander Lobrano’s charming, friendly, and authoritative Hungry for Paris, the fully revised and updated guide to this renowned culinary scene. Having written about Paris for almost every major food and travel magazine since moving there in 1986, Lobrano shares his personal selection of the city’s best restaurants, from bistros featuring the hottest young chefs to the secret spots Parisians love. In lively prose that is not only informative but a pleasure to read, Lobrano reveals the ambience, clientele, history, and most delicious dishes of each establishment—alongside helpful maps and beautiful photographs that will surely whet your appetite for Paris. Excerpt: Alexander Lobrano’s “Hungry for France” – My appetite for France (excerpt & recipes), including recipe for Layered Ratatouille Gratin, published on A Woman’s Paris®. Every food lover’s ultimate dream is to tour the countryside of France, stopping off at luxurious inns with world-class restaurants and sampling fresh produce from local markets. Imagine having as your guide a savvy bon vivant, someone who lives for the pleasures of the table and knows just where to ferret out all the delicacies in each town. Uniting all of the places in the book is an embracing of the farm-to-table ethos that has swept France’s new generation of chefs and fueled such movements as Le Fooding. Hungry for France will inspire you to transform your cooking at home as well as plan the trip of a lifetime. AWP: Why did you feel that now in particular would be the right time to publish your book, Hungry for France? AL: Hungry for France is celebration of the fact that I’ll soon have lived in France for almost thirty years, during which time I’ve traveled to every corner of the country to discover its restaurants and produce, and also of the fact that a remarkably talented and passionate young generation of French chefs and food producers is currently renewing the country’s gastronomic laurels for a new century. AWP: Were you on a quest to taste the last great French dishes before they disappeared forever—from Paris’ surviving haute cuisine establishments to the tiny local restaurants that still serve regional dishes from Normandy to Provence? AL: My selections for the book were very much based on the idea of showcasing the brilliant young gastronomic talent in France right now—chefs, but also cheese-makers and mongers, jam-makers, charcutiers and others… The traditional foods and cooking styles survive—and thrive—everywhere, so I include some favorites in these terms, too. AWP: Each chapter covers different regions in France, with their varied cuisines and cultures. Why did you decide to publish one book including every region? AL: French cooking is the sum of all of the country’s regional kitchens—every region has contributed something to the canon of the French kitchen, so it was logical to approach a book about eating in France through the structure of its regions. AWP: What did you like best about each region? AL: The regions of France are extremely different, of courses, but they share a deep pride in and knowledge of their individual gastronomic traditions, which is why I so deeply enjoy those places that are most specific to each region—the estaminets of northern France, the bouchons of Lyon, the winstubes of Alsace, etc. AWP: Tell us about the research for Hungry for France. What were the challenges, and how did you unfold the story you wanted to share? AL: The bedrock of French gastronomy is the richness of the country’s regional cooking and regional foodstuffs, so this story really told itself, though through the prism of my own experience. The largest challenge of doing a book like Hungry for France is that I had only a limited number of pages to fill, which meant that I had to be painfully selective in terms of the restaurants and other addresses I included. Although I prioritised the new generation of talent, I also included a variety of traditional addresses that are long-standing favorites, too. AWP: During your research for Hungry for France, where wouldn’t you go? What cuisine wouldn’t you try? AL: There’s no region of France I haven’t visited, and no cuisine in Gaul that I haven’t been lucky enough to sample. AWP: What was the most surprising thing you learned about French food and the intertwined culture and tradition of regional cuisines in France? AL: What moved me the most is the deep attachment that the French continue to have to their ancestral foodways, and the fact that this proud knowledge is still so collective. If you ask anyone in France where Camembert comes from, for example, they’ll tell you it’s from Normandy, and they could also recite a whole litany of great dishes that are associated with every region. AWP: What was the most surprising thing you learned about French chefs’ culinary secrets? AL: People often ask me if French food is still as superlative as it was in the past, and I tell them that the reason French food continues to be so outstanding is that the country has such extraordinary produce and that its young chefs also receive the best and most rigorous culinary education of any country in the world. AWP: When you started writing Hungry for France, did you have a sense of what you wanted to do differently from other authors whose work you had seen? AL: I’ve read and enjoyed many other books about eating in France through the years, but I knew that mine would be different. It is seen through the prism of being a native of American suburbia, but also from having lived in the country for almost thirty years and being able to speak the language fluently, knowing its history and art, and having succeeded at creating a French life for myself. AWP: Are there things that you feel haven’t been said about French cuisine that you are trying to explore in your work now? AL: Every meal and every shopping trip yield new experiences that warrant further writings. AWP: What makes Paris such an incomparably wonderful city to eat in? AL: Paris has become a global magnet for gastronomic talent the same way that it attracts artists and fashion designers from all over the world, and this new development is adding a fascinating and delicious layer to the culinary offer of the French capital. The exigence of Parisians—together with their gastronomic curiosity—make it a very dynamic city in food terms, too, so that you have a remarkable range of choices in Paris, everything from traditional bistro to contemporary ones, bistrots a vins and wine bars, and compared to most of the world’s other large western cities, including London, New York, LA and Sydney, the quality of what’s offered is generally remarkable, especially in relation to the price. Then, too, Paris probably has the most remarkable larder of any city in the western world—all of the best of France finds its way to the capital, including incredibly fresh fish from both Atlantic and Mediterranean ports, for example. AWP: Which restaurant offers a perfect snap shot of modern Paris? AL: Septime in the 11th arrondissement is an ideal example of the new French cooking in Paris in the 21st century—chef Bertrand Grebraut’s cuisine is ingredient-centered, fresh, healthy, and intelligently inventive. The service style at this restaurant is warm and outgoing, too, and it’s a beautiful room with a relaxed, friendly atmosphere. AWP: Is there one restaurant or brasserie that channels everything you love about Paris? AL: If there’s a single restaurant that distills what first seduced me gastronomically when I visited the city as a teenager, it’s Josephine Chez Dumonet in the 6th arrondissement, a superb old-fashioned bistro with excellent cooking, a gorgeous Belle Epoque décor, and efficient friendly service. AWP: Do certain restaurants and cafés play a significant role in culture, politics and intellectual life in Paris? AL: The tribes of Paris frequent certain restaurants, which have become their canteens—the Café de Flore, for example, is still a vital center of literary Paris, while other restaurants are ‘power tables’ where you’ll run into the political and business elite. AWP: In your research of French cuisine and encounters from friends and colleagues, and in the streets of France, what kind of diner does one find today? AL: Parisians are deeply knowledgeable and curious about food, and are increasingly adventurous eaters when they come to the table. AWP: More than any other chef in Paris today who best knows how to unlock the emotional content of taste? AL: Since every great chef masters an emotional keyboard of his or her own, they are happily dozens of chefs in Paris whose cooking provokes a deep emotional reaction. AWP: How can North Americans experience the perfect meal in Paris? Do they bring a different set of expectations? Do you have a few pointers from the locals? AL: I’ve often said that the balance of power at the table is very different between France and North America. The French have a deep respect for the art of cooking, and so would never dream of asking if someone could leave the garlic out of a recipe, etc. North American restaurants are much more custom-centric, and in many ways, this is wonderful, but when you’re in Paris, you’ll have a happier experience in the city’s restaurants if you take your cues from the natives, i.e., the French don’t drink coffee with their meals, wouldn’t dream of having a Coke at the table, etc. It’s acceptable, of course, to make special requests for health reasons, but otherwise, I find it’s best to let the chef do his or her magic without restraints. AWP: Do Parisians have a different attitude toward what they eat than North Americans? AL: The French are much less caught up with ‘health’ at the table than Americans are, for the simple reason that they assume, mostly rightly, that the food served in their restaurants is wholesome. They’re also less obsessed with calorie-counting and the whole business of low-fat, which they see as a perversion, since fat often conveys some of the best taste you can add to a dish. The French don’t snack or eat between meals, and they don’t want the enormous portions that have become perversely standard in North America. AWP: You write that Paris is one of the best cities in the world for anyone who loves Lebanese food. Why? AL: Because Lebanon was a French protectorate, the Lebanese are often Francophone and Francophile, with many of them coming to France to be educated. So Paris has a substantial Lebanese community, which creates a market for seriously good Lebanese cooking, a kitchen that’s also popular with other visitors from the Middle East. AWP: Is there one particular cuisine that weaves throughout the history of Paris? AL: The cuisine of Paris is French, but the one dish that runs through its entire history is soup. AWP: French food: are there quintessentially French dishes that the Parisians love best? AL: Oysters and steak tartare are true Parisian favorites. AWP: At times you intimately describe a dish as though it is a character—its tease, its elusiveness; and in recounting dishes within a full course meal as though it is a dialogue among friends—its ebb and flow, its grasp. How do you unfold the story you want to tell? AL: I think any good story unfolds through the prism of the imagination disciplined by verbal rigor. AWP: You have great insights into human nature and the sublime experience of dining together; a theme that runs through your books. What is the most surprising thing you learned about the French? AL: Beyond their apparent reserve and formality, the French are immensely warm and generous, and it gives them huge pleasure to share their food with strangers. AWP: What are the rituals and rhythms of life in France that you’ve observed? Do you find rituals important to good health? Can you bring us through a typical French persons day: le petit déjeuner, le déjeuner, le gôuter, le diner? AL: The French respect the rhythms of healthy eating, and they also follow the seasons, which is why you rarely see strawberries in French supermarkets or on French menus during the winter. They know that there is a best time to eat everything, a season for everything, from vegetables like asparagus to various cheeses. AWP: In restaurants, you dine with friends and you eat alone. How do you make dining alone into an extraordinarily pleasant experience? Is there a story behind your first time? AL: Once you realize that you’re never eating alone, but rather you’re having the pleasure of your own company, any awkwardness or stigma melts away. And in France and most other European countries, the solitary diner is warmly welcomed and well-treated, which is a measure of the importance attached to good food. The first meal I ever ate alone in a proper restaurant was long ago in Brussels, an experience that I describe in HUNGRY FOR PARIS. AWP: Auguste Escoffier said: “Cooking becomes genius when things taste of what they are.” Which chef best understands the chimera or simplicity of this aesthetic? AL: Most of the great chefs of Paris and France deeply understand this dictum and practice it daily. AWP: Do you have a culinary mantra? AL: Try everything not once but twice. AWP: Minding our manners, sociability, conviviality—is there an art to conversation at a French table? AL: Don’t interrupt anyone, don’t ask personal questions, don’t talk about money or politics. Let people reveal themselves to you slowly. AWP: Is there an art to complaints if one is unhappy with a dish—with a valid reason, of course? AL: Whenever I send something back, I always begin by saying, “Je suis vraiment desolee mais….” Or I’m really sorry but… If you’re polite and able to explain what it is about the dish that displeases you, most of the time your complaint is received graciously. AWP: What do you feel is missing from the restaurant table? Are there dishes one finds served only at the French family table? AL: I regret the slow disappearance of a proper cheese tray—cheeses are more and more often served plated now, and I also miss such old-fashioned dishes as oeufs en gelee (soft-boiled eggs in aspic), which you don’t see much anymore. The only home-cooking dish that comes to mind that you might find in Paris is restaurants is a good parmentier, or the French version of shepherd’s pie, often made with duck or beef. AWP: Your career has taken you from book and magazine editing into the world of writing about food. What inspired you toward a life and career so dependent on words and the ability to communicate? AL: A deep love of reading, a huge curiosity about everyone and everything, and an insatiable love of travel. AWP: Your books, Hungry for France and Hungry for Paris have had a huge impact on Francophiles, travelers and expatriates living in France. What do you think it is about your books that make readers connect in such a powerful way? AL: I’d like to think that people respond to a narrative voice that’s warm, honest and intimate. I never see myself as a food critic, i.e., the one who knows better, but rather as someone who writes about food, because I enjoy it so much and have learned that it’s the fastest and most joyous way of discovering another culture. AWP: You have great wit and an engaging style. What inspired you to write these books? AL: Knowing that I’ve been very lucky in constructing the life I have, I really wanted to share my love of French food and France. AWP: What do you think today’s food writers bring to the travelers’ experience? AL: The opportunity to have an intimate experience with a culture where you might be a stranger or don’t speak the language. AL: I think creative people are moved by the beauty of Paris, and also that being foreign drives you more deeply into your own thoughts and makes you more observant. AWP: How did your interest in Paris unfold? AL: I fell in love with the city’s beauty, the elegance of its daily life and its food. AWP: When you moved to France, how did you grapple with the cultural differences? Can you share the moment when you knew it had changed for you? AL: It took me a while to understand that my deeply ingrained American good manners—don’t complain, let other people go first, etc.—were rather useless in Paris. It’s not that the French are rude, but the self-effacing element of good manners in North America strikes them as foolish. So I had to learn to pipe up for myself, stake a complaint, give it back as good as I was getting it. AWP: What French cultural nuances, attitudes, ideas, or habits have you adopted? In which areas have you embraced a similar aesthetic? AL: The French brought out my latent respect for discretion, subtlety and thrift. AWP: How did you become a “little bit” French? AL: By eating in France for thirty years. AWP: You moved to Paris in 1986. What was Paris like nearly thirty years ago? How is it different today? AL: Alas, there’s a lot more traffic in Paris today than there was thirty years ago, and the city is filled with many of the same shops you find in other cities all over the world. On the other hand, it’s cleaner and there are some wonderful new parks that have been created since I arrived. AWP: You write about the “public” life of Parisians. How do you describe their understated elegance? AL: Parisians innately understand that what isn’t shown is often sexier than what is. AWP: What is the best part about living in Paris? AL: The beauty of the city and the small elegant rituals of daily life, the way that someone packs a cake in a tent of pink paper with a gold ribbon handle, for example. AL: What is it like? Ah, well, my Paris is a very much a city of restaurants, food shops and great markets. AL: My favorite times of the year in Paris, and the ones I suggest to friends planning a trip, are the winter, when the crowds have thinned and French food tastes so good in the cold weather, and August, when there’s something winsomely melancholic about the great stilled city baking in the heat after many people have left for vacation. AL: The next book I’d like to write is a personal account about how I moved to Paris and became a food writer. Anything by A.J. Liebling or Mavis Gallant, the late Canadian short story writer who lived in Paris for many years. I also love the Belly of Paris by Emile Zola for its account of the life of Les Halles, the great main market of Paris in the 1st arrondissement before it moved to suburban Rungis. The Hare with the Amber Eyes by Edmund de Waal also offers a fascinating account of 19th century Paris, as do the writings of Flaubert, de Maupassant and Proust. Hungry for Paris (second edition): The Ultimate Guide to the City’s 109 Best Restaurants (April 15, 2014, Random House Trade Paperbacks). Acknowledgement: Iona Davidson, student of French and Italian at the University of Oxford, England, and English editor for A Woman’s Paris. Hotspots and Hot Chocolate: Student Cafés in Paris by Parisian Flore der Agopian. The Left Bank has always been “the place to be” for intellectuals, artists and students. By strolling through the famous Latin Quarter, which attracts many students from the whole of France, you can feel the lively, bustling atmosphere created by the presence of the famous universities, such as La Sorbonne. Follow Flore as she visits the seven most famous student cafés in Paris. A literary feast – Cafés and culture in Paris’ 9th arrondissement by Parisian Flore der Agopian. Paris has always been an inspiration for writers and painters, both from France and all over the world. Flore explores how cafés in nineteenth century Paris inspired literary figures Emile Zola, Alexandre Dumas, George Sand, Guy de Maupassant, Marcel Proust and French painters Edgar Degas, Eugène Delacroix, Camille Pissaro, and Edouard Manet. Including a list of current cafés in Paris’ 9th arrondissement. Boulangerie Poilâne: A toast to French Breads, by Barbara Redmond who shares her face-to-face encounter with a French baker during her visit to the 18th century ovens of Poilâne in Paris. Could she steal a pinch from the raw, soft-white boule in its proofing basket resting close by? The penetrating aromas of bread; strong, yeasty, and hot… Recipes included for Tartine Chocolat et Poivre (tartine of melted chocolate and black pepper) and La tartine For’bon (tartine of cheeses and ham) from Boulangerie Poilâne. French Cuisine: Cooking schools in Paris founded by women, by Barbara Redmond who writes about extraordinary women who cook: from Anne Willan, Marthe Distel, and Elisabeth Brassart, to “Les trios gourmands,” Julia Child, Simone Beck, and Louisette Bertholle. Including a directory of cooking schools in Paris. Text copyright ©2014 Alexander Lobrano. All rights reserved. Photography copyright © Steven Rothfeld. All rights reserved. Leave a reply on "French Impressions: Alexander Lobrano on eating well in France: a culinary tour of alluring inns, food producers, restaurants and winemakers"